The Gare Saint-Lazare (also known as Interior View of the Gare Saint-Lazare, the Auteuil Line), depicts one of the passenger platforms of the Gare Saint-Lazare, one of Paris’s largest and busiest train terminals. The painting is not so much a single view of a train platform, it is rather a component in larger project of a dozen canvases which attempts to portray all facets of the Gare Saint-Lazare. The paintings all have similar themes—including the play of light filtered through the smoke of the train shed, the billowing clouds of steam, and the locomotives that dominate the site. Of these twelve linked paintings, Monet exhibited between six and eight of them at the third Impressionist exhibition of 1877, where they were among the most discussed paintings exhibited by any of the artists. Light—the dominant formal element in so many Impressionist paintings—is given particularly close attention in The Gare Saint-Lazare, the Auteuil Line. Here, as in many of the Impressionists’ most celebrated paintings, Monet shows a bright day and labors to reproduce the closely observed effects of pure sunlight. The billowing clouds of steam add to the effect, creating layers of light that fill the canvas. 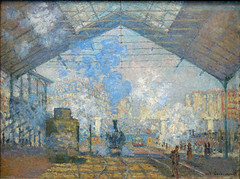 Here however, we must pause as The Gare Saint-Lazare, the Auteuil Line is an exception within the full group—it is one of only two paintings of the train station shown on a bright bright, sunny, day. In contrast, the other ten paintings (for example the one at the Harvard Art Museums, above) show dark, hazy views of the Gare Saint-Lazare. Though an exception and anomaly in terms of its interest in sunlight, The Gare Saint-Lazare, the Auteuil Line shares a great deal in common with the other paintings at least in terms of subject and view. Monet’s achievement is extraordinary, and The Gare Saint-Lazare, the Auteuil Line has rightfully been singled out as among the most impressive paintings of Impressionism. Monet renders the steam with a range of blues, pinks, violets, tans, grays, whites, blacks, and yellows. 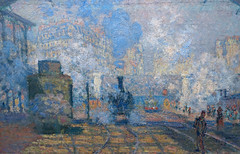 He depicts not just the steam and light—which fill the canvas—but also their effect on the site—the large distant apartments, the Pont de l’Europe (a bridge that overlooked the train station), and the many locomotives—all of which peak through, and dematerialize into a thick industrial haze. The Gare Saint-Lazare, the Auteuil Line and the other paintings of the Gare Saint-Lazare by Monet are hardly an isolated moment in the artist’s oeuvre. In the 1870s Monet—along with most of the other major Impressionists including, Caillebotte, Pissarro, Renoir, Degas, Guillaumin, Raffaëlli, and even Manet—had shown a steady interest in the railroad as a subject within their paintings of modern of life. In fact, the six to eight paintings Monet exhibited at the Third Impressionist Exhibition were shown along with Caillebotte’s monumental Le Pont de l’Europe (below) that likewise shows the train yards of the Gare Saint-Lazare. Caillebotte’s painting though shows the site from the great iron bridge that crossed over the yards—the Pont de l’Europe. Interestingly, Caillebotte’s painting of genteel strollers set in the bourgeois world of Paris’s grand boulevards drew praise, while Monet’s paintings of trains, steam and industrial activity were severely criticized. Perhaps the criticism is due to the fact that Monet shows the locomotives as the main subject, rather than as background elements. He shows them unapologetically, in their natural element, among the steam, workers and activity of the bustling train station. 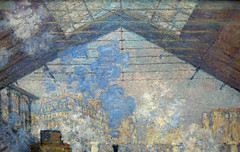 Four paintings in the set of twelve, including The Gare Saint-Lazare, the Auteuil Line, show the large and distinctive cast iron spans that covered the platforms. However, the other paintings show the exterior, the yards, workers, tunnels, switches, sheds, and engines of the station. Indeed, even in The Gare Saint-Lazare, the Auteuil Line and the other so-called interiors of the of the train shed, Monet includes workers, steam, and industrial machines. In fact, what he does not show is the grand hotel, lavish entrance or sculpture of the station’s impressive façade. Even in the interiors, the paintings are very much the business end of the station. These common subjects—train, steam, and industrial activity—raise the question of whether the works should be regarded as series. Though scholars have frequently discussed the works, and particularly the four interiors, as part of series, only two of the works show a repeated (or serial) view. When taken as a whole the group does not seem to be the manifestation of an interest in serial painting or an exploration of subtle changes only evident in repeated views (as Monet will later do with his series of grain stacks) bur rather as an effort to capture the varied aspects of the station by rendering its many faces in paint. 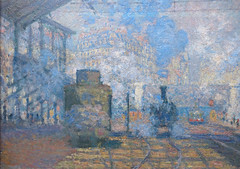 In The Gare Saint-Lazare, the Auteuil Line Monet shows his keen interest in light, color, and paint handling, yet The Gare Saint-Lazare, the Auteuil Line cannot be divorced from its subject—the locomotives, the steam, and the yard of the Gare Saint-Lazare. In this bright scene Monet gives us a new vision of modern life that does not shy away from its industrial side. Descubes, A. “L’Exposition des impressionnistes” Gazette des lettres, des sciences et des arts, vol. 1, no. 12 (20 April 1877), pp. 185-188. Maillard, “Chronique: Les Impressionnistes” Le Pays (April 9, 1877), pp. 2-3. Cite this page as: Dr. Tyler E. Ostergaard, "Monet, The Gare Saint-Lazare," in Smarthistory, February 25, 2016, accessed April 21, 2019, https://smarthistory.org/monet-the-gare-saint-lazare/.